Accu-Spina for spinal stenosis can cure disc-enacted canal impingement and possibly help to reduce the severity of mixed causation stenosis where bulging discs play a role in canal narrowing. Disc-related canal impingement is not considered a true form of stenosis, since it is often transient and can be resolved using a variety of surgical techniques and a few nonsurgical practices that do not actually enlarge the spinal canal at all. Instead, as long as the symptomatic disc herniation is reduced in size, the symptoms should dissipate, providing a true cure. 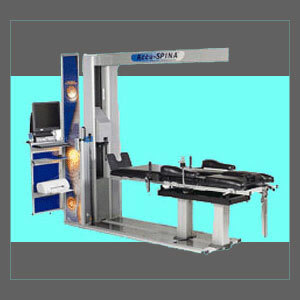 Accu-Spina is one of the many choices for nonsurgical spinal decompression that are available today all around the world. The device is highly effective at treating indicated conditions and can be a valuable part of a spinal stenosis treatment program for patients with specific conditions. This essay profiles the use of Accu-Spina decompression therapy for treating central and foraminal stenosis. Central canal stenosis is usually caused by narrowing of the space by the arthritic processes, including the development of bone spurs and arthritic debris inside the canal. However, in some cases, central stenosis of a transient variety might result from large acute herniated discs that compress the spinal cord or impinge on the nerves of the cauda equina, depending on anatomical region affected. In cases of disc-enacted central stenosis, Accu-Spina treatment is indicated when symptoms do not qualify for emergency surgical care. In cases of dire symptoms, like cauda equina syndrome, paralysis, incontinence and others, surgical correction is the best path of treatment, since nonsurgical decompression is an extended duration therapy. In cases of mixed causation central stenosis, which is very common when herniated discs combine with typical arthritic accumulations to focally decrease areas of the central canal, spinal decompression can reduce the degree of stenosis and possibly relieve symptoms, depending on how much of the condition is actually caused by the intervertebral disc contributor and how effective the treatment is at reducing the size of the herniation. Single level neuroforaminal stenosis is rarely a medical emergency, making nonsurgical decompression a more logical choice for symptomatic patients. Once again, the best use for Accu-Spina is in patients who are suffering from pinched nerves due to foraminal narrowing which is caused exclusively by herniated discs, usually of a posterolateral variety. Decompression can completely cure many of these conditions without the need for surgical intervention. In cases of mixed causation neuroforaminal stenosis with disc contributors, the use of Accu-Spina decompression is slightly less effective, but can still work well for many patients. In cases of purely arthritic-enacted stenosis of the neural foramen, decompression may or may not work. Some cases of facet joint osteophyte-related stenosis can be resolved symptomatically, although recurrences might occur in the future, especially if the arthritic growth continues to progress around the foraminal opening. Accu-Spina can be used to treat a range of known and idiopathic back and neck pain syndromes. However, we highly recommend using it for herniated, degenerated and bulging disc-enacted stenosis exclusively, as these indications demonstrate the very best therapeutic outcomes. Additionally, make absolutely sure that the disc to be treated is a contained herniation and has not ruptured, extruded or sequestered, as these circumstances can greatly reduce treatment efficacy. If other spinal decompression options are available, you might want to investigate them as well, since cost of treatment can vary greatly and all systems are very effective for indicated diagnoses. Other devices to consider include the DRX9000, VAX-D and Antalgic Trak, as well as the newer Hill DT system.